Pim kinases in hematological malignancies: where are we now and where are we going? 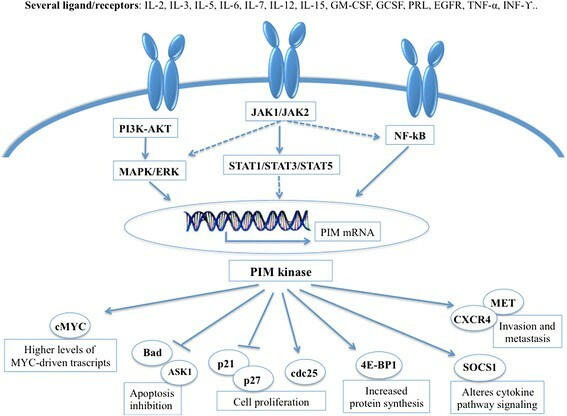 The proviral insertion in murine (PIM) lymphoma proteins are a serine/threonine kinase family composed of three isoformes: Pim-1, Pim-2 and Pim-3. They play a critical role in the control of cell proliferation, survival, homing and migration. Recently, overexpression of Pim kinases has been reported in human tumors, mainly in hematologic malignancies. In vitro and in vivo studies have confirmed their oncogenic potential. Indeed, PIM kinases have shown to be involved in tumorgenesis, to enhance tumor growth and to induce chemo-resistance, which is why they have become an attractive therapeutic target for cancer therapy. Novel molecules inhibiting Pim kinases have been evaluated in preclinical studies, demonstrating to be effective and with a favorable toxicity profile. Given the promising results, some of these compounds are currently under investigation in clinical trials. Herein, we provide an overview of the biological activity of PIM-kinases, their role in hematologic malignancies and future therapeutic opportunities. The proviral insertion in murine (Pim) lymphoma family proteins, whose gene locus was discovered as a proviral integration site for Moloney murine leukemia virus infection, consists of three serine/threonine kinase isoforms: Pim-1, Pim-2 and Pim-3 . These proto-oncogenic kinases are constitutively active and they are mainly regulated at the transcriptional and translational level , by cytokines and growth factors involved in hematopoiesis, such as interleukin (IL)-2, IL-3 ,, IL-6, granulocyte-macrophage colony-stimulating factor (GM-CSF) and granulocyte-colony stimulating factor (G-CSF) . Furthermore, the stability and function of Pim kinases depend on their interaction with heat shock protein (Hsp) 90, a chaperone protein involved in folding and stabilizing different molecules . Hsp90 showed not only to protect Pim-1 from ubiquitin-26S-proteasomal degradation, but also to mainten the proper conformation of Pim-1 . Pim kinases play a critical role in the control of cell proliferation and survival. They are downstream effectors of important oncoproteins, such as Ableson (ABL) , Janus Kinase 2 (JAK2)  and FMS-like tyrosine kinase 3 (FLT3) . Although Pim kinases exert similar functions, they have different tissue distributions ,. While Pim-1 and Pim-2 are predominantly expressed in hematopoietic cells ,, Pim-3 expression is high in brain, kidney, and epithelia ,. Due to their aberrant expression in human tumors -, they could be important contributors in the pathogenesis of neoplasias including lymphomas, gastric, colorectal and prostate cancers . The oncogenic potential of Pim kinases has been studied on transgenic mouse models. In the Eμ-pim1 model only 5–10% of mice developed T-cell lymphoma, suggesting that Pim-1 alone is not able to induce a massive proliferation . Interestingly, infection of these transgenic mice with murine leukemia virus (MuLV) promoting the integration of the provirus in the Pim-1 locus  enhanced dramatically the incidence of tumors and reduced the latency of T-cell lymphoma development . The activation of either c-Myc or N-Myc was involved in every tumor, suggesting an oncogenic collaboration between Myc and Pim-1 genes in lymphomagenesis ,. Co-expression of both Eμ–Pim1 and Eμ–Myc was incompatible with life, leading the transgenic mice to succumb to lymphomas in utero or around birth. Conversaly, Eμ-Myc;Eμ-Pim1 mice with low expression of c-Myc were viable and with low tumor incidence . The oncogenic role of Pim-1 and its cooperation with c-Myc have also been studied in prostatic cancer. Pim-1 demonstrated to promote prostate tumorgenesis by enhancing the transcriptional activity of androgen receptors. Notably, Pim1-expressing cells presented an increased c-Myc transcriptional activity as well. Treatment with the c-Myc inhibitor 10058-F4 reduced Pim-1 protein and suppressed the tumorigenicity of the prostate cancer cells . In addition, Pim kinases have been demonstrated to cooperate with other oncogenes, such as bcl2 , bcl6 , runx2 , E2a-pbx1 , frat1 . PIM knock-out studies have shown that mice deficient in all three Pim kinases are viable and fertile, supporting the tolerability of pan-Pim inhibition . Mikkers et al. demonstrated that the lack of these kinases resulted in only a decrease of erythrocyte mean cell volume (MCV) . However, a recent study has proved that the triple PIM knock-out affected multiple lineages of hematopoietic cells as well as the self-renewal of hematopoietic stem cells (HSCs) . Based on these results a careful monitoring of potential hematological side effects is recommended with the Pim inhibitors treatment. In this review we provide an overview of the biological background of Pim kinases, their role in hematologic malignancies and a summary of possible drugs targeting theses enzymes. Pim kinases are critical components of distinct pathways that play an important role in cell proliferation and survival - (Figure 1) and especially in apoptosis, cell cycle regulation, cell proliferation and cell migration. Mechanisms regulating Pim levels and downstream activation. Pim kinases prevent cells from apoptosis by phosphorylating the proapoptotic Bcl-2–associated agonist of cell death (Bad). Phosphorylation of Bad on Serine (Ser) 112 and Ser136, respectively by Pim-1 and Pim-2, induces 14-3-3 binding, which results in loss of the binding with the anti-apoptotic protein Bcl-2 and, consequently, in cell survival -. Similarly, phosphorylation of Bad on Ser155 by Pim-3 was found to prevent Bad from binding to the anti-apoptotic protein Bcl-xL . In addition, the pro-survival activity of Pim kinases seems to depend also on direct phosphorylation of the apoptosis signaling kinase 1 (ASK1) , which decreases significantly ASK1 activity and inhibits ASK1-mediated phosphorylation of JNK and p38. Ultimately this phosphorylation event leads to blocking caspase-3 activation and decreasing apoptosis levels . Pim kinases usually phosphorylate Mdm2 on Ser166 and 186, an E3 ubiquitin ligase which mediates ubiquitylation and proteasome-dependent degradation of p53 . Notably, these residues are targets of other signaling pathways including Akt -. When Pim kinases are overexpressed, such as in tumors, they block the degradation of both p53 and Mdm2 in a Mdm2-independent manner, leading to an increase of p53. In addition, Pim-1 enhances p14ARF activity , a Mdm2 inhibitor well known to arrest the degradation of both p53 and Mdm2 itself ,. Finally, Pim-2 maintains high levels of NFkB required for its antiapoptotic function. Indeed, transcriptional targets of the NF-kB include many genes associated with survival, such as Bcl-2 and Bcl-xL. Hammerman et al. demonstrated that Pim-2 activates NF-kB by inducing phosphorylation of Cot, a serine/threonine kinase downstream to both MAPK/ERK and NF-kB signaling pathways . Furthermore, Pim-1 phosphorylates RelA/p65, the main subunit of NF-kB, preventing its degradation from ubiquitin-mediated proteolysis. Knocking down Pim-1 severely impaired cell survival, at least in part, by interfering RelA/p65 activation . Pim kinases are involved in cell proliferation through the phosphorylation of the cyclin-dependent kinase inhibitors p21 at Threonine (Thr)145 and Ser146 ,, p27 at Thr157 and Thr198 . Phosphorylation of p21 induces its translocation from the nucleus to the cytoplasm, resulting in cell proliferation and survival ,. Overexpression of Pim-2 leads to enhanced levels and stability of p21, while knockdown of Pim-2 results in reduced levels of p21 . Notably, treatment with pan-Pim inhibitor lowered not only Pim-2 kinase activity, but also p21 phosphorylation . An inverse relation seems to exist between Pim and p27 levels. Morishita et al. have demonstrated that phosphorylation of p27 by Pim kinases prompts its binding to 14–3–3 proteins and subsequent nuclear exclusion and degradation of p27. Furthermore, Pim kinases seem to down-regulate p27 at the transcriptional level by inactivating Forkhead transcription factors . In addition, Pim-1 seems to influence cell cycle phase transition by phosphorylating critical tyrosine phosphatases: Cdc25A for the G1/S and Cdc25C, and the Cdc25C-associated kinase (C-TAK)1 for the G2/M ,. In further support of its role in the cell cycle, Pim-1 showed to phosphorylate the nuclear mitotic apparatus protein (NuMa), that is essential for mitotic spindle formation and aids in chromosome separation. Pim-1 seems to contribute to maintenance of a stable connection between NuMA, dynein/dynactin and the pericentric protein HP1β, a complex that is necessary for mitosis. Notably, the ‘kinase-dead’ mut-Pim-1-GFP fusion protein hinders the progression of mitosis and results in rapid cell death by apoptosis . Pim-1 and/or Pim-2 are significant downstream targets of transcription factors STAT 3 and STAT 5 . Pim kinases in turn are able to influence the JAK/STAT pathway through their direct interaction and phosphorylation of Suppressor of Cytokine Signalling (SOCS)-1, a well-known regulator of this signaling pathway ,. The modulation of SOCS1 by Pim kinases seems to have a critical role in v-Abl-induced tumorgenesis. In the xenograft model v-Abl was not able to transform bone marrow cells deficient in the Pim-1/Pim-2 model, but it partially succeeded in its transformation activity combining the triple knockout of Pim-1, Pim-2 and SOCS1 . Although Pim kinases are pro-oncogenic proteins, they are not sufficient to initiate disease  and therefore a cooperation between Pim-1 and c-Myc is required for promoting STAT3-mediated cell cycle progression . Both Pim-1 and Pim-2 phosphorylate c-Myc, increasing its stability and consequently its transcriptional activity . Recently, it has been demonstrated that this cooperation takes place also at the transcriptional level through Pim-mediated phosphorylation of preacetylated hystone H3 on Ser10 (H3S10) . The H3S10 phospholytation is required to mediate the interaction with 14-3-3 proteins  and the ensuing recruitment of the histone acetyltransferase MOF, which acetylates histone H4, generating a nucleosome platform for bromodomain-containing protein 4 (BRD4) binding. Thereafter, the positive transcription elongation factor b (P-TEFb) is recruited inducing the phosphorylation of RNA polymerase II (Pol II) and the release of stalled Pol II, which activates transcriptional elongation . However, Pim kinases contribute for about 20% of Myc-induced gene expression . c-Myc stability is mainly controlled by the ubiquitin–proteasome system, in particular by Fbxw-7 . An inverse proportion exists between Fbxw-7 and c-Myc levels ,, consequently Fbxw-7 deletion was associated with c-Myc accumulation and aberrant cell cycle entry ,. Mutation of Fbxw-7 has been found in solid - and blood malignancies . In addition, also the control of miRNA expression plays an important role in Myc-mediated tumorgenesis. Several studies found that c-Myc repressed a wide range of miRNAs by directly binding the promoter of these miRNAs ,, favoring Myc-mediated tumorgenesis and conferring a more aggressive feature. Pim activity is synergistic with another independent pro-survival pathway, phosphoinositide-3 Kinase/Akt/mammalian (PI3K/Akt/mTOR) . Pim-2, but not Pim-1, has been identified as the principal kinase that phosphorylates the translational repressor 4E-BP1 and p70S6 independently of the PI3K/Akt/mTOR pathway . Indeed, the activation of Pim-2 revealed an important role in cell growth resistant to rapamicin, an mTOR inhibitor . Therefore, suppressing Pim-2 is important to treat rapamycin-resistant tumors. The Pim proteins also revealed an involvement in signaling pathways that control cell migration. Pim-1 plays a significant role on MET expression, the receptor for hepatocyte growth factor (HGF) involved in signaling normal and tumor cell migration and invasion. Pim-1 controls the translation of MET by phosphorylation of eukaryotic initiation factor 4B (eIF4B) at Ser406 and the use of Pim inhibitor has been associated with a significant decrease of MET expression . In addition, Pim-1 showed an influence on the chemokine ligand 12 (CXCL12)/chemokine (C-X-C motif) receptor 4 (CXCR4) expression, a ligand/receptor system with a crucial role in normal homeostasis , especially in the hematopoietic stem cells grafting ,. Extracellular signal-regulated protein kinase 1/2 (ERK1/2) ,, PI3K  and Syk  transduction pathways showed to be differently implicated in CXCR4-mediated migration and proliferation. The imbalance of CXCL12/CXCR4 axis is implicated in cancer progression and spreading of tumor-initiating cells . In vitro experiments suggested that Pim-1 might regulate CXCR-4 expression through phosphorylation of the Ser339 in the intracellular domain involved in receptor internalization . Pim-1 overexpression has proved to correlate with CXCR4 levels also in leukemic blasts. Interestingly Pim inhibitor treatment led to downregulation of CXCR4 surface expression in primary cells, inducing impairment of Pim-mediated cell survival and block of CXCR4-mediated interaction of cells with their protective microenvironment ,. Overexpression of Pim kinases has been observed in different human cancers, but mainly in haematological malignancies . Initially, overexpression of Pim-1 was found in human myeloid and lymphoid leukemias ,. In acute myeloid leukemia (AML) increased levels of Pim-1 have been associated with aberrant expression of the mixed-line-age leukemia (MLL) gene  as a consequent activation of tyrosine-kinase receptor FLT3 or the transcriptional regulator Hoxa9 ,-. Almost half of diffuse large B-cell lymphoma (DLBCL) tissues showed an increased expression of Pim kinases ,, which is even more frequent in the activated B-cell (ABC) subtype due to the constitutive activation of JAK/STAT3 signaling . Brault et al. proved a strong correlation between level expression of Pim kinases, STAT signaling, higher proliferative rate, and more advanced disease stage. Therefore, these findings suggest the possible role of Pim kinases as markers for DLBCL progression . Increased levels of Pim-2 were also found in mantle cell lymphoma (MCL), follicular lymphoma (FL), marginal zone lymphoma-MALT type (MZL-MALT), chronic lymphocytic leukemia (CLL), nodal marginal zone lymphoma (NMZL) ,, and multiple myeloma . Pim kinases are attractive therapeutic targets since they are often aberrantly expressed in several hematologic disorders and because they contribute to cellular proliferation and migration. A large number of new molecules have been produced so far. While most of them are specific inhibitors of Pim-1, only few are able to inhibit all Pim isoforms , (Table 1). However, because of the overlapping functions of these kinases, a pan-Pim inhibitor resulted to be more effective than a selective one . IC50: 7 nM PIM1, 363 nM PIM2, 69 nM PIM3, 44 nM FLT-3 and 34 nM Haspin . IC50: 21 nM PIM1, 100 nM PIM2 . Selective vs. 56 kinases . IC50: 0.001 nM PIM1, 0.0021 nM PIM2, and 0.0008 nM PIM3 . IC50: 3 nM PIM1,2 and 3 . IC50: 31 nM PIM1, 154 nM PIM2, 152 nM PIM3. Selective in a panel of 299 kinases with the exception of haspin, HIPK and CLK kinases . IC50: Pim-1 0.4 nM, Pim-2 5.0 nM and Pim-3 1.9 nM . A first generation of Pim-inhibitors (SGI-1773, SGI-1776) demonstrated high antitumor activity both in vitro and in vivo in different hematological tumors -. SGI-1776 is an imadizaopyridazine with nanomolar activity not only on the three Pim kinases, but also on Flt3 and Haspin. Therefore, the real contribution of Pim inhibition to the efficacy of this compound is unclear. In contrast to SGI-1773, SGI-1776 has shown to induce an almost complete suppression of Cyclin D1, cMYC and MCL1. In addition, SGI-1776 has been demonstrated to overcome Pim2-mediated rapamycin resistance without increased toxicities in a mouse model . Based on these positive results, a phase I clinical trial recruiting castration-resistant prostate cancer or relapsed/refractory non-Hodgkin lymphoma patients was conducted. However, due to unexpected severe cardiotoxicity the trial was ended early. (NCT00848601) This event could be related to the inhibition of Pim-1, which has been demonstrated to play an important role in the promotion of cardioprotective signaling and inhibiting pathological injury ,. Second generation Pim-inhibitors were designed to increase specificity and to eliminate cardiotoxicity. SMI4a is a benzylidene-thiazolidene-2,4-dione inhibiting PIM1 (24 nM) and PIM2 (100 nM) . This molecule is able to induce G1 arrest through a marked increase of p27 and consequently inhibition of cdk2. In a mouse model SMI4a induced a delay in tumor growth without important toxicity . SMI4a demonstrated synergy with the mTOR inhibitor rapamycin by downregulating p4EBP1 and blocking proliferation in AML cells . Since SMI4a increases phosphorylation of ERK1/2, its association with a MEK1/2 inhibitor also showed a good synergistic activity leading to a higher death rate of precursor T-cell lymphoblastic lymphoma cells . LGB321 is a 3-(S)-amino-piperidine pyridyl carboxamide, ATP-competitive inhibitor of all three Pim kinases with a 50% inhibitory concentration (IC50) for Pim-1, Pim-2 and Pim-3 of 0.001, 0.002 and 0.0008 nM, respectively. LGB321 was tested in different hematologic cell lines such as ALL, AML, multiple myeloma and B-cell NHL. Among all studied cell lines, the multiple myeloma subtype was the most sensitive with IC50 values in the picomolar range. LGB321 efficacy and safety profiles were also confirmed in vivo models . Based on these data, a phase I clinical trial evaluating the LGB321 activity in relapse/refractory myeloma is ongoing (NCT02144038). AZD1897 is an ATP-competitive pan-Pim inhibitor with IC50 of 3 nM against Pim-1, 2 and 3 , recently evaluated in treatment of AML. In vitro studies demonstrated a limited activity of AZD1897 as a single agent, but a strong synergy in combination with the AKT-inhibitor AZD5363. This association led to a greater cytotoxic activity as well as a decreased downstream mTOR-targets (p4EBP1, pS6 kinase) and MCL1 levels with respect to the single agent therapy . Based on the remarkable anti-leukemic activity of AZD1897 combined with AKT inhibition future clinical trials are warranted. SEL24-B58 is able to inhibit all three Pim kinases already at picomolar dose (IC50 values are: Pim-1 31 nM, Pim-2 154 nM and Pim-3 152 nM). In vitro SEL24-B58 reduced Mcl-1 levels, demonstrating synergy in combination with the Bcl2-family inhibitor ABT-737 in leukemic monocyte cells. The combination with JAK1/2 inhibitor (Cyt387) in lymphoblastic leukemia cells resulted in a synergistic antiproliferative activity as well. A Xenograft model confirmed the efficacy of SEL24-B58 at a concentration of 150 mg/kg with a completed arrest of tumor growth after 17 days of treatment and no toxicity . AZD1208 is a thiazolidene, highly selective for Pim-1, Pim-2 and Pim3 with a low nanomolar activity in cells (IC50 of 0.4 nM for Pim-1, 5.0 nM for Pim-2, and 1.9 nM for Pim-3) . AZD1208 demonstrated in vitro and in vivo activity against AML. A significant growth inhibition was evident in a dose-dependent manner. Indeed, AZD1208 led to decreased phosphorylation of Bad, 4EBP1, p70S6K, and S6, as well as increased cleaved caspase 3 and p27 . Notably, it showed to be active in Flt3-ITD primary tumor cells without the off-target inhibition activity  unlike previous PIM inhibitors ,,. Based on these interesting data, AZD1208 is currently being evaluated in phase 1 clinical trials. (NCT01489722, NCT01588548). Pim kinases create a wide interest in oncology due to their overexpression in cancer and association with enhanced tumor growth and chemo-resistance. Given the close advent of Pim inhibitors in clinic, it is important to find their most efficient application. First of all biomarker identification might allow to select the patients and follow the course of treatment. So far, no genetic markers have been established to guide therapeutical decision. Therefore, it may be worth improving the knowledge of Pim-dependent gene expression and verify the existence of a correlation between high levels of different subsets of Pim-regulated genes and increased sensitivity to treatment. Another open question is whether Pim kinase inhibitors should be used as monotherapy or in combination. Preclinical data have shown that Pim inhibitors are effective drugs when used as single agents. However, their positive effect was even more pronounced when they were combined with chemo- or other target-therapies (Pi3k/AKT/mTOR inhibitor). In addition, these inhibitors demonstrated to significantly reverse drug resistant phenotypes in preclinical models. It is necessary to wait until the conclusion of clinical trials using Pim kinases inhibitors to see if tumor cells will develop resistance through other signaling pathways. Finally, evaluation of toxicity will be important as well due to the difficulty in finding the right balance between sufficient inhibition and acceptable toxicity when multiple signaling inhibitors are combined. In the near future research should focus on the activity of Pim kinases and their involvement in resistance mechanisms in order to allow for a more efficient treatment and application. This article did not receive any specific grant from any funding agency in the public, commercial or not-for-profit sector. The authors have no conflicts of interest regarding the publication of this article. MP revised the literature and wrote the manuscript; CS and MM were involved in revising the manuscript critically for important intellectual content. All authors read and approve the final manuscript.